FOR WEBSITE OR BLOG MAINTENANCE GO HERE! INVESTMENT: USD $1150.00 in advance, OR payable in TWO Equal Payments of $590. Domain & Hosting: $90/Year Via Siteground — Recommended. Unless you have hosting already. You get a Huge over 40% Discount on Above Price if you use our Link! Implementation and set up plus first quarter activity details as below under “IMPORTANT DETAILS“. (Unless client needs or demands exceed this time frame.) Details to be agreed with customer/client T &Cs apply. We Design, Bespoke Blogs Unique to You, Built By Us. We at JWEB Solutions appreciate that you need a cost effective solution for your blog or web design and in some cases ongoing maintenance & updates. As your organisation’s Online ‘store-front’ your web page design should make the best impression possible. We are here to deliver that for you. Plus of course you need your potential customers/clients or new business to be able to find you fast and keep your ‘edge’ over your competition. INVESTMENT: USD $1899.50 payable in advance. Or TWO equal Payments of $965.50 USD. First Payment upfront and second made before Handover of site. Usually within 6-8 weeks from start of Project! Annual contract for maintenance available on request. • Upload of product details on Design. Thereafter User to Upload own product. • Unlimited sections & products configurable by user. Design and build: USD $1899.50 + Domain and Hosting. Adding eCommerce to your Website is also possible From USD $500. 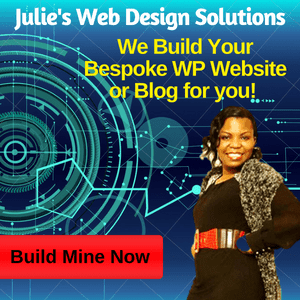 IMPORTANT DETAILS: Jules Web Design Solutions (JWEB) is part of the The Kalungi Group Brand and we take every care to ensure that you are completely satisfied with your Brand new Site/Blog. Once you order a Package you will immediately receive an email that confirms your purchase along with a form that we need you to FILL OUT as Fully as Possible including any Extras, or Special Needs. This will help us build your site YOUR WAY FASTER. Our Team works in Europe and is English Speaking – GMT London or BST time. Once you return the above form to our design team, expect your new WordPress blog to be completed within 4 weeks for Basic Static Site and 4-6 weeks for an e-commerce Site. (Extent of the design work taken into consideration.) You’ll be able to speak with your designer via Email or Skype if you need to, so you know your project gets the desired attention. 1 Year of 1 Domain Registration is included in the e-Comm price. You will need to Provide Hosting or we can arrange that as Extra! And if you or you know anyone who needs Site Maintenance, we are happy to have a chat with them.